Hull FC moved back into the top 8 of Super League with a thoroughly unconvincing, but priceless win. Coach Lee Radford brought winger Tom Lineham back in to replace Curtis Naughton on the right wing and teenager Jack Logan replaced the injured Kirk Yeaman as the black and white’s went in search of revenge over Wakefield Trinity Wildcats for the defeat at the Rapid Solicitor’s stadium on Wednesday. Feka Palea’aesina also returned to the squad in place of Dean Hadley for the Super League Round 19 game while Leon Pryce and Marc Sneyd brought their combination back together at the expense of Jamie Shaul and Jordan Abdull with Jordan Rankin returning to his favoured full-back position. The Wildcats got the first attacking opportunity when skipper Gareth Ellis dropped the ball in Hull’s first set giving the visitor’s a scrum 15 meters from the line and they duly took full advantage with the opening try inside two minutes from Matty Ashurst, former FC half back Jacob Miller then added the extras to give them a 0-6 lead. The pouring rain then seemingly caused another mistake as Wakefield knocked-on from the kick off giving Hull a scrum close to their line and they struck straight back in the 5th minute as Joe Westerman touched down a grubber kick by Sneyd under the posts, Sneyd then obliged to bring the scores level. The visitors then forced another mistake from Hull and got a scrum 30 meters from the Hull line but the chance was wasted as a forward pass on the 20 meter line gave the Airlie Birds a chance to regain possession from another scrum and clear their lines. Hull forced another chance as Logan made a break in mid-field and then passed to Ellis but the captain was held up over the line, eventually another chance forced a goal line drop out. Hull attacked again from the drop out but a chance went begging as the ball was dropped 10 meters from the Wakefield line despite the rain having stopped by this point. Another bomb from Sneyd then forced another chance as the Wildcats knocked on again 10 meters from their line but the opportunity was blown with a forward pass on the first tackle giving them easy possession back. An attack from Hull then saw possession surrendered embarrassingly easily and former Airlie Bird Jordan Tansey kicked ahead twice and eventually dropped on the ball beside the posts to give the Wildcats the lead again in the 22nd minute, the goal from Miller made it a six point difference again. To their credit Hull came back straight away again as an inside pass from Steve Michaels put Logan over in the 25th minute wide on the left hand side however Sneyd missed the conversion to leave them trailing by two points. Hull then invited Wakefield to attack when giving away a soft penalty for offside which Miller put into touch 20 meters from the home sides line and then, after being awarded another penalty, the visitors opted to go for the kick at goal and Miller obliged to stretch the lead to four points in the 30th minute. Hull were then given a similar opportunity from a penalty for offside which Sneyd planted into touch 20 meters from the visitors line and after four tackles a fast cross-field move put Michaels in at the corner in the 34th minute to bring them level again, the touchline conversion from Sneyd hit the post and bounced out. A knock on at the play-the-ball from the Wildcats afforded the black and white’s another chance with a scrum 30 meters out and the resulting attack saw Setaimata Sa held up over the line and then a grubber kick from Sneyd caused a mistake by the visitors which gave them a goal line drop out but a lack of creativity meant Hull were unable to break down the defence again. However Hull were given a penalty as the half time hooter sounded 30 meters out and Sneyd gave the home side a two point lead going into the break. The Wildcats kept Hull waiting before coming back out for the second half to a chorus of boo’s from the Old Faithful. Hull had the first meaningful attack of the half but a challenge for a high kick led to a knock on which gave the visitor’s chance to clear again. The next attack however in the 45th minute led to a try as the Wildcats defence made a hash of clearing another Sneyd grubber and teenager Logan pounced for his 2nd try of the afternoon, the conversion by Sneyd stretched the home sides advantage to eight points. Another attack by Hull promised much again but then after being awarded a penalty Liam Watts dropped the ball on the first tackle 10 meters out. The Wildcats then struck back through another former Hull player after Rankin made a hash of clearing a grubber kick and Reece Lyne took advantage to bring his side back into it in the 49th minute, the conversion from Miller reduced the deficit again to two points. In the bright sunshine both sides were attempting to be more expansive and an impressive side-stepping run from NRL bound prop Mickey Paea produced a magic moment as the ball was moved swiftly to Rankin for the full-back to make up for his previous mistake and score in the corner to make it 26-20 in the 55th minute, Sneyd again missed the touchline conversion. 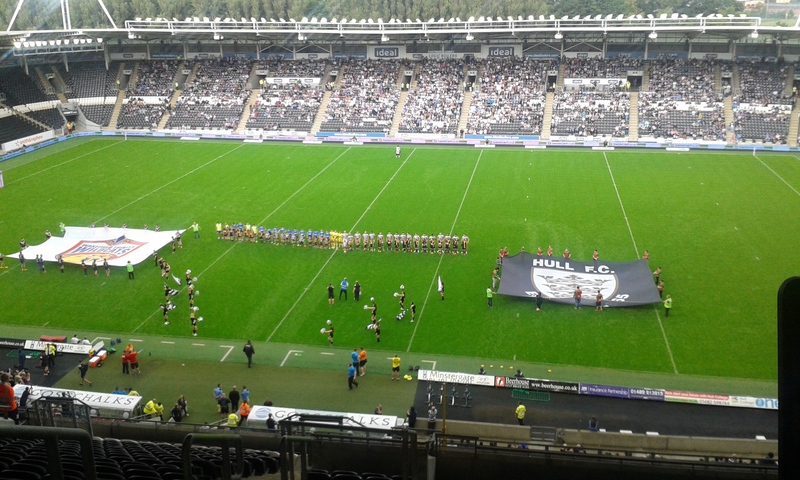 However Hull again invited the Wildcats down to the other end and Tom Johnstone scored an easy try in the right corner as Hull’s defence ran out of men in the 58th minute, the touchline conversion from Miller was wayward to leave Hull leading by two points. The game continued in its topsy-turvy fashion and Hull were presented with another opportunity after they forced a scrum 30 meters from the visitors line but the opportunity was lost because of a lack of direction and then Johnstone cleared as he took Sneyd’s kick almost out of Michaels hands. After another attack by the visitor’s Hull suddenly swept down-field as fast as a Powerboat on the Humber Estuary as Rankin raced through the middle and then passed just at the right moment to give Michaels the chance to finish spectacularly in the left corner in the 64th minute, another miss from the touchline by Sneyd left the score at 30-24. The next visit to the opposition end of the field saw Hull force the third goal line drop out of the game and a quick set-up led to a drop goal from Sneyd in the 68th minute to leave the visitor’s needing to score twice. Johnstone kept making an impressive impression on the game with his darting runs, natural pace and genuine confidence but on his next break he was squeezed out into touch by a fast moving home defence. Once again Hull were looking telegraphed on the last tackle and although they showed some imagination at times this was being far from a vintage performance as their attacking frailties and lack of execution in vital areas, which had seemingly been banished just six weeks ago, now looks to be back with a vengeance in the last few weeks. Radford said afterwards that Ellis was ruled out for 4-6 weeks on Thursday but had sent him a text saying not to rule him out and that he wanted to take a fitness test which then led to him being drafted back into the match day team having been left out of the original 19 man squad. He also said that Mark Minichiello could possibly return from injury for the visit of Castleford Tigers to the KC Stadium next week, however Kirk Yeaman has been ruled out for 4-6 weeks.